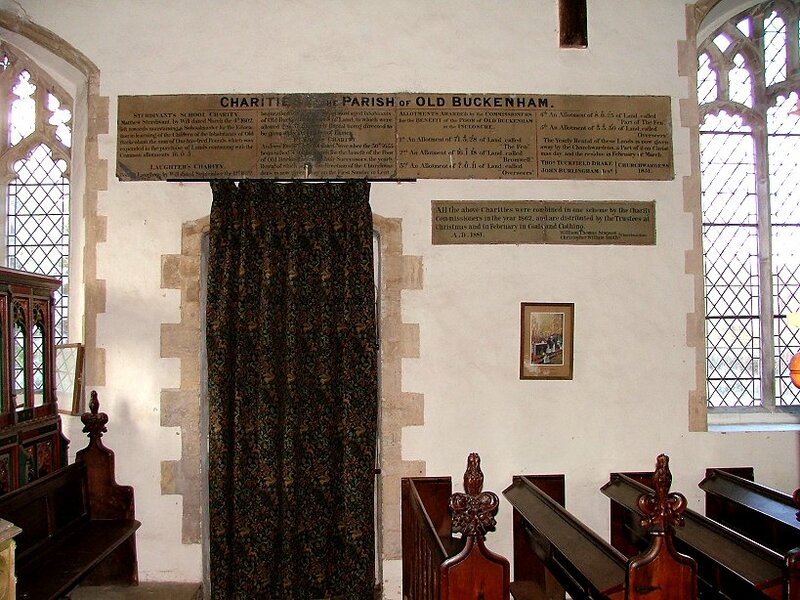 New Buckenham and Old Buckenham, a couple of miles apart, couldn't be more different. 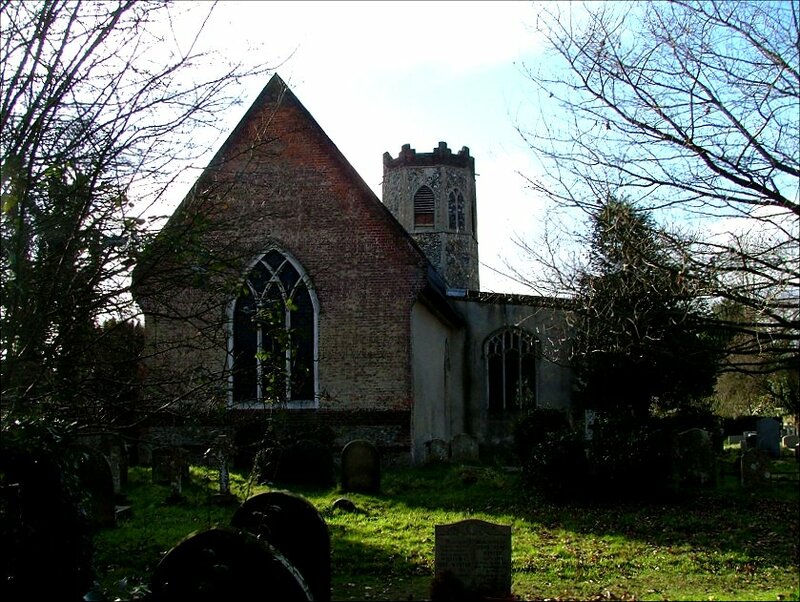 New Buckenham is a planned 12th century town, a rare beast in any county, while the old village spreads thinly around a wide village green, quintessentially East Anglian, although more common in Suffolk than in Norfolk. The green covers forty acres, so there is no sense of a clustered village. The road cuts through the middle of the green, and you leave its noise behind you as you move away from it to cross what is the biggest village green in East Anglia after that at Barrington in Cambridgeshire. On the east side of the green is a decent pub and the church of All Saints, set back from the green behind a characterful village hall. 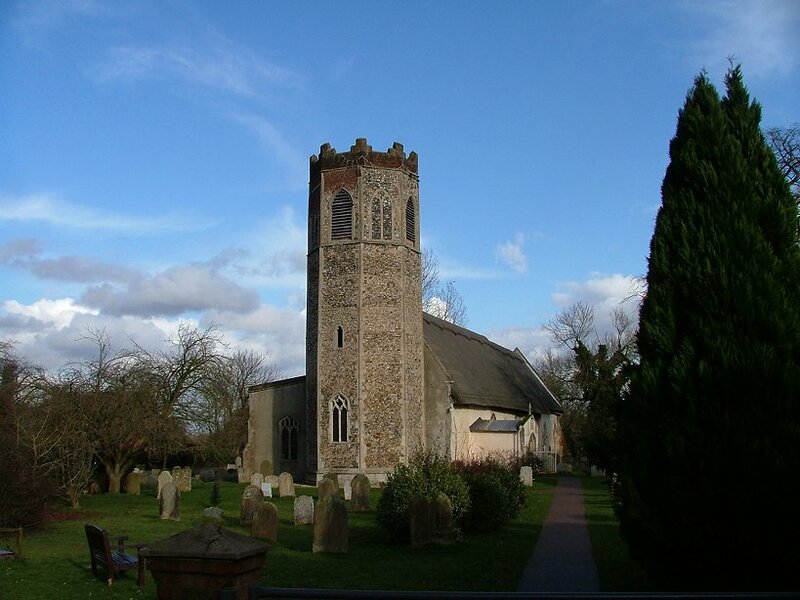 The tower of the church is octagonal, from the top to the ground. 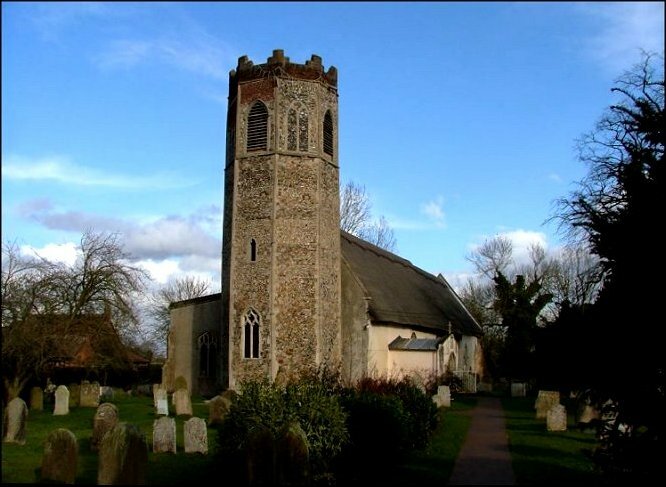 In fact, it is an early 14th century casing of an earlier round tower; you can see the same phenomenon elsewhere in Norfolk at Kettlestone and Toft Monks. 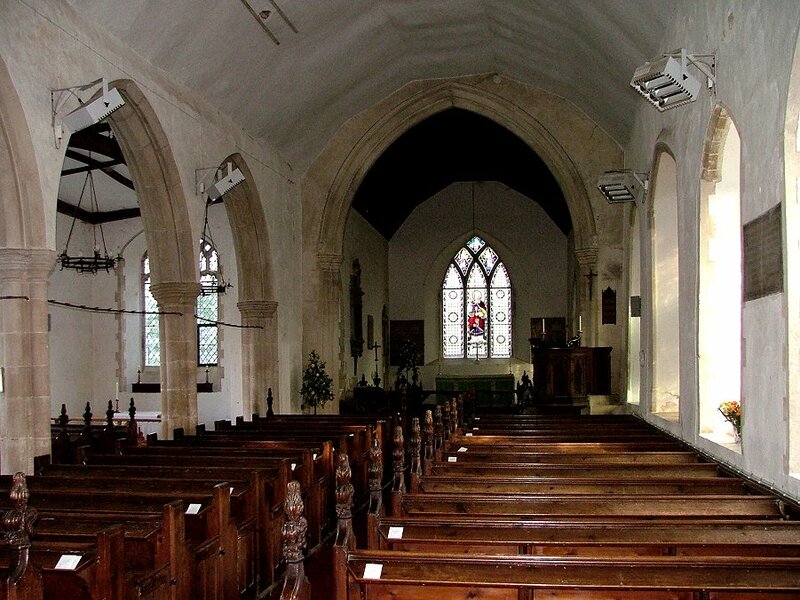 The continuous nave and chancel beyond is thatched. 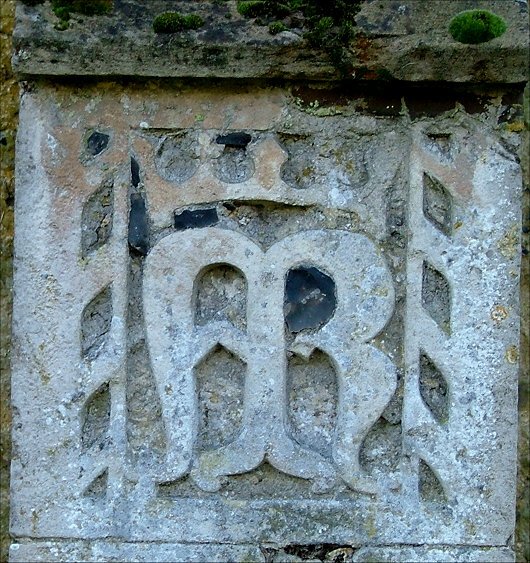 There are sacred monograms on the buttresses on the north side. All in all, it is a delightful assemblage. 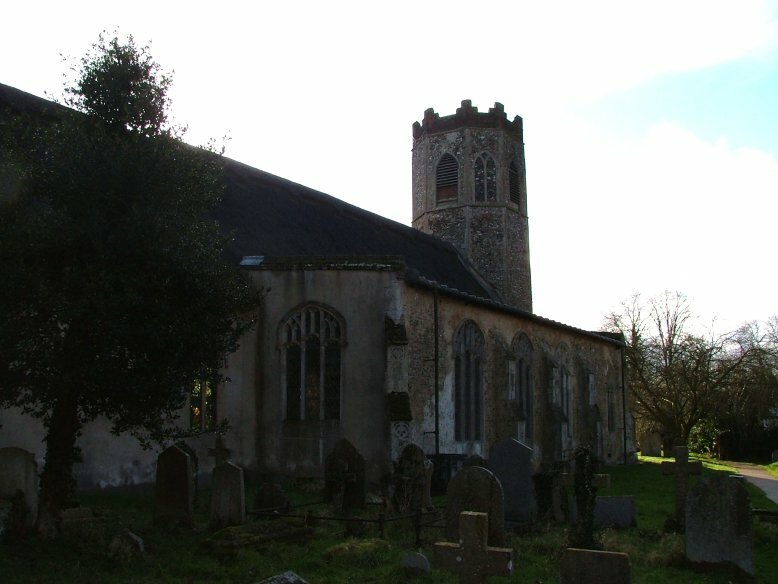 The church is pretty much all the early 14th century building you'd expect from the style of the tower, and even though the eastern part of the chancel has been rebuilt it has been done to fit in. 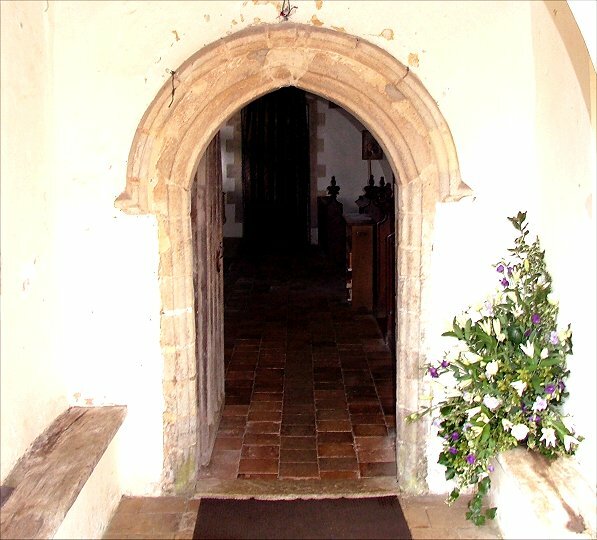 There are hints of an earlier building in the form of a late Norman doorway and proportions in the nave that we have come to recognise as Norman. 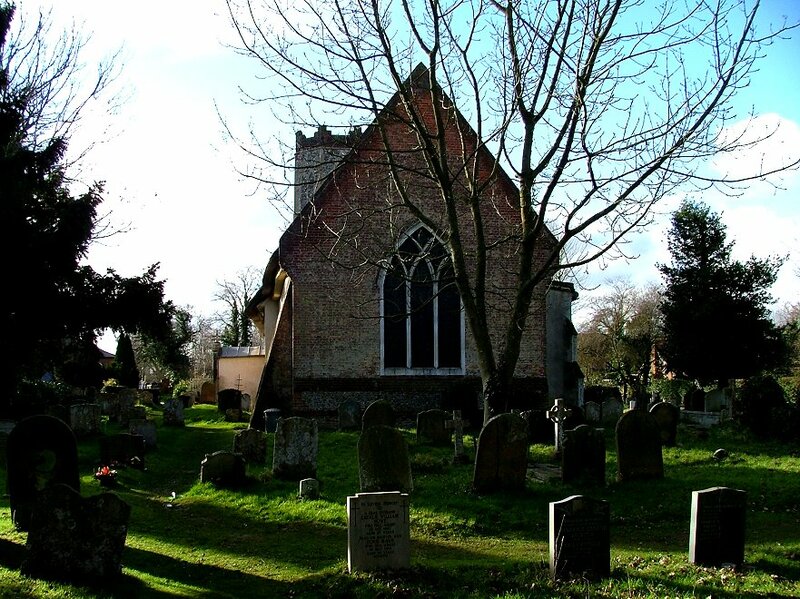 The churches in south Norfolk, once you get away from the Waveney valley, are mostly open and welcoming during the day. 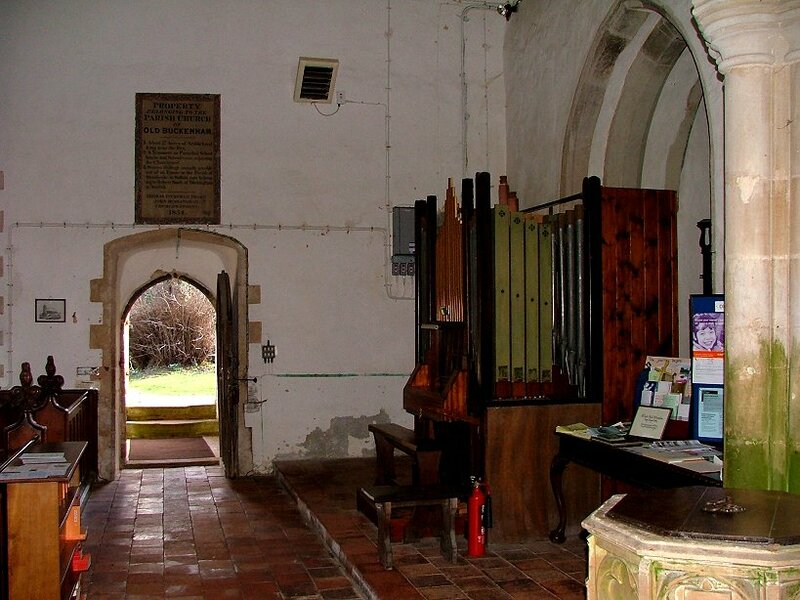 All Saints was militantly so, with both the inner and outer doors wedged open. Even so, it was colder inside the church than out after the Siberian temperatures of the previous week. 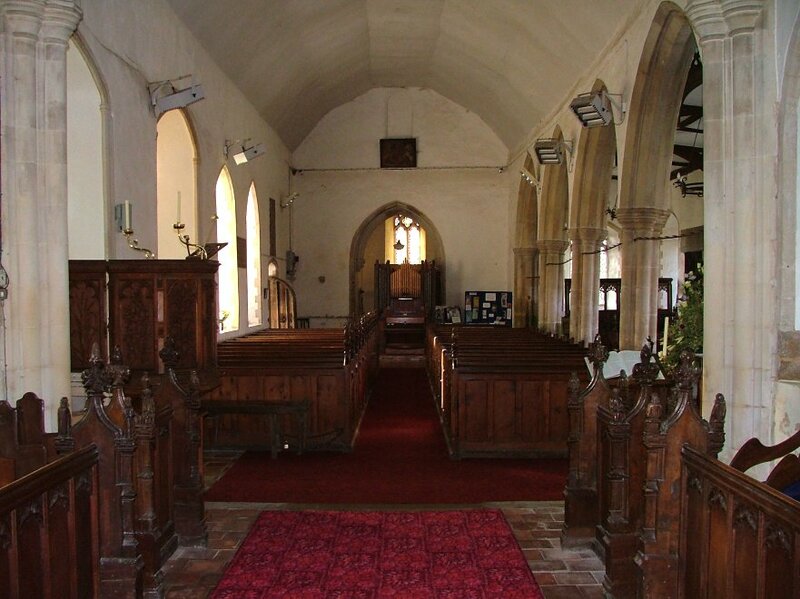 The north aisle, tucked out of sight as you approach, opens up inside to create a lovely, square space, completely rural in character. 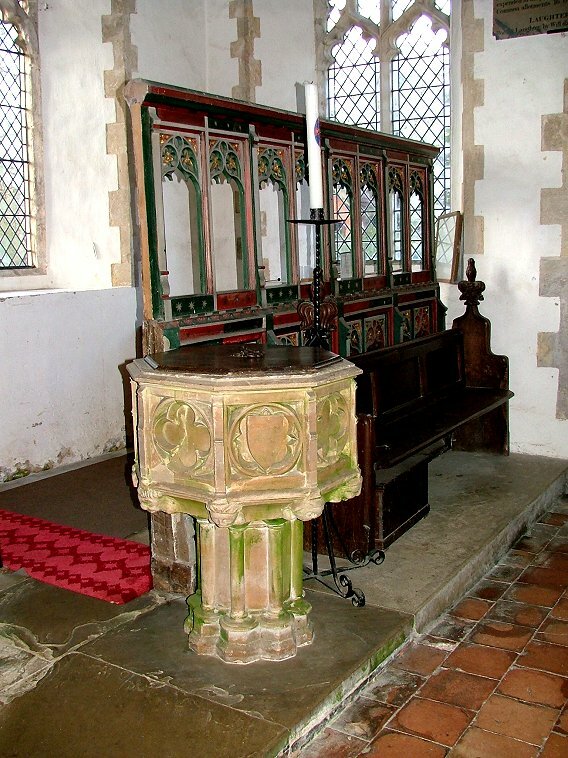 Nothing is flamboyant, everything is simple, even the pretty screen reused in the north-west corner to create a vestry. Mortlock noted a sense of yellow-washed Victorian calm, which is a good way of putting it. 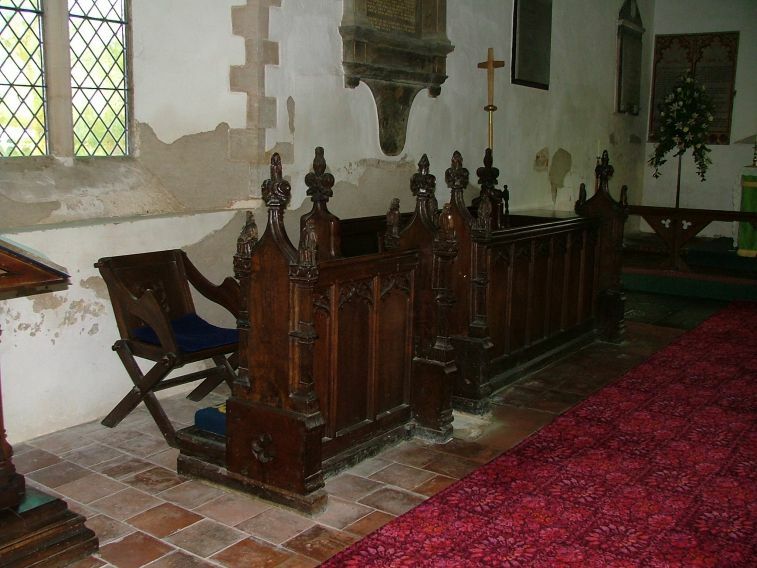 The great treasure of this lovely church is the set of medieval bench ends now reused on the stalls in the chancel. 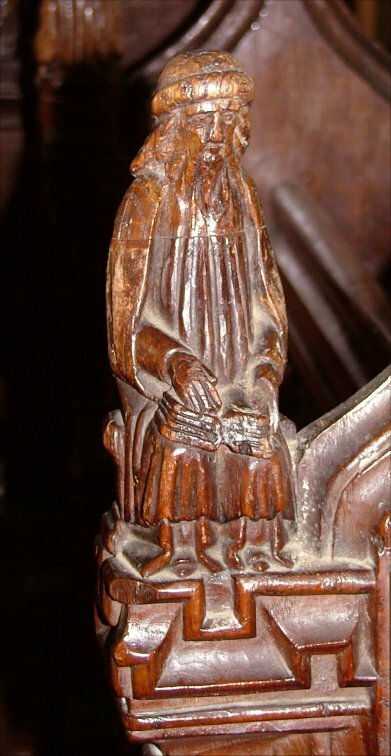 They depict thirteen figures, and they are generally considered to be Old Testament Prophets. 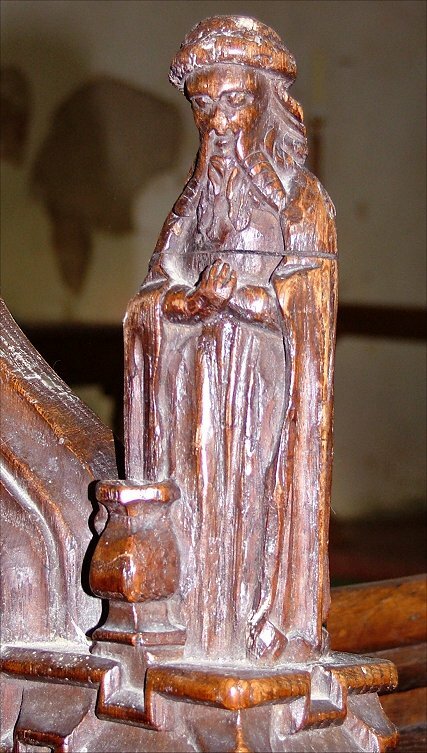 If so, the one with the pot is Isaiah, and three figures are missing. 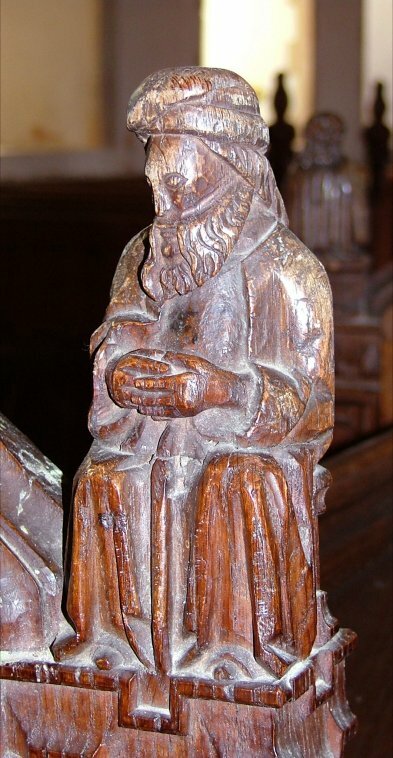 However, one of the figures has been tentatively identified as St James the Less by his emblem, a fuller's club, although I did not think this convincing. 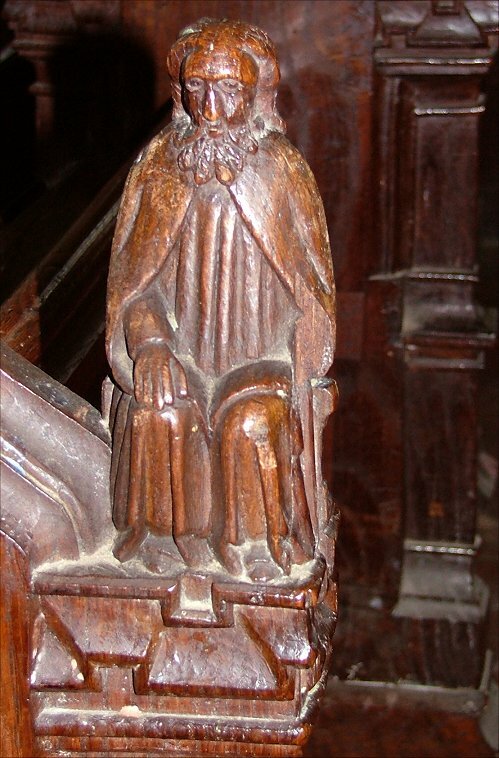 If it is St James the Less, then it would be part of a combined Prophets and Apostles set, and fifteen are missing. Even so, they are a lovely find. Back at the west end, the font is worth a second glance. At first sight, the panels are merely blank shields and fleurons, but if you look under the bowl there are eight grim little faces, each one different, and none of them looking particularly happy. 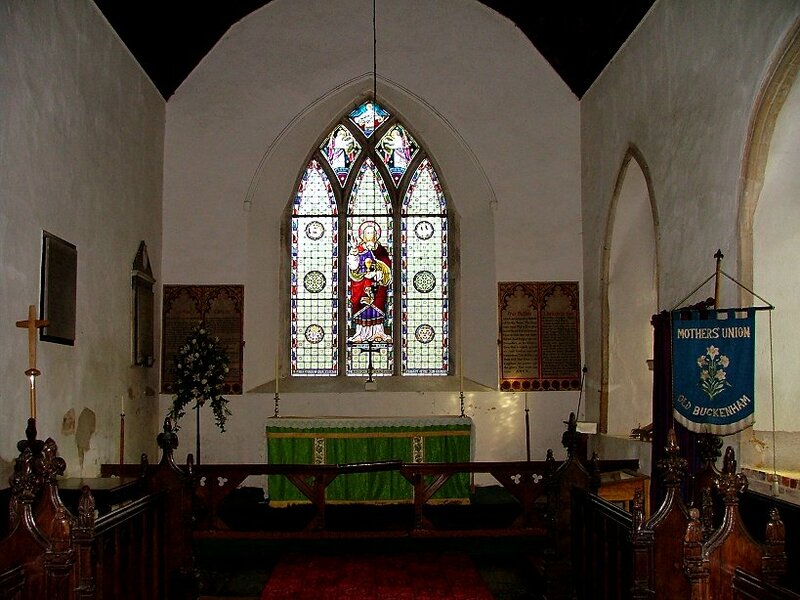 The nave has two significant and interesting windows. 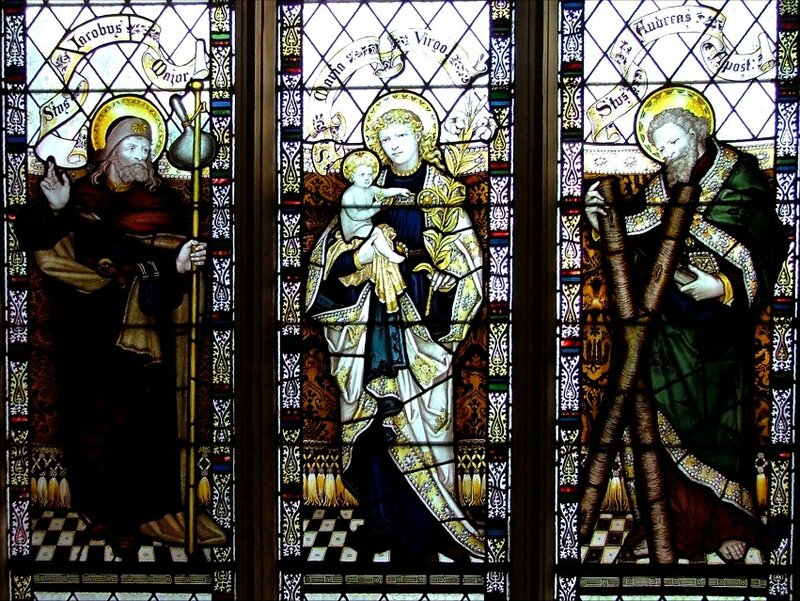 The best is by Charles Kempe, and features St James and St Andrew flanking the Blessed Virgin. 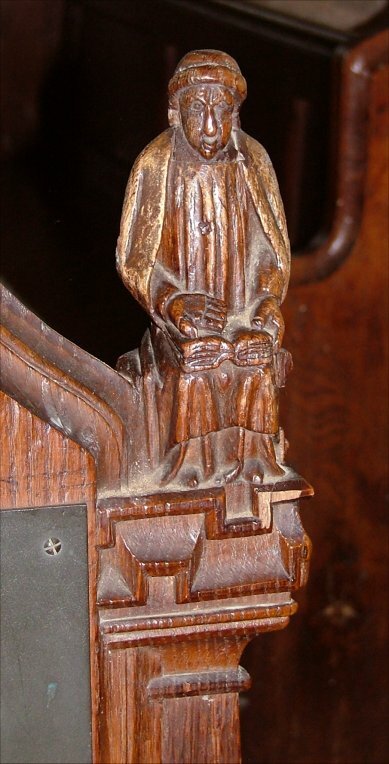 There are medieval fragments in the tracery above. The other is more curious. 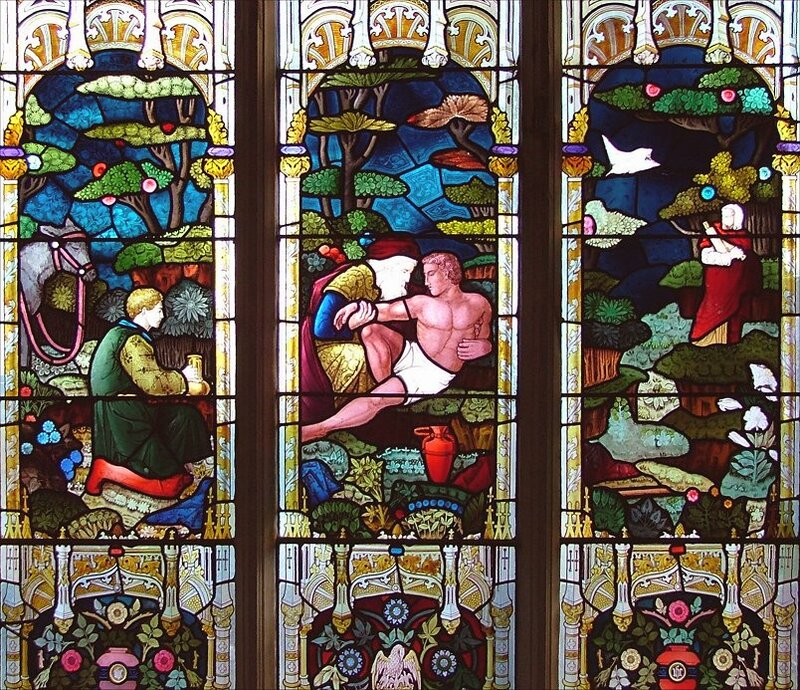 It depicts the story of the Good Samaritan, a very popular subject in this part of Norfolk. However, the three light window here is a bit different, because as well as the Samaritan kneeling in the first light we have the High Priest scurrying away in the third light. Even odder, the figure of the injured man in the middle is a reverse depiction of Michaelangelo's Adam - except that, this being late 19th century rural Norfolk, he is wearing a pair of underpants. The trees and flowers in the background are done in a gorgeous, idealised medieval style; but the pink man in the middle doesn't half distract you from them.